It is a blend of 80% Assam and 20% Darjeeling tea. Both the leaves are whole leaf organic tea. These tea are anti-bacterial, anti-viral, anti-depressant, and boost immunity against cancer and other diseases. They also control bad cholesterol and artery clogging. We are recognized in the industry for offering a distinguished grade of Assam Tea. 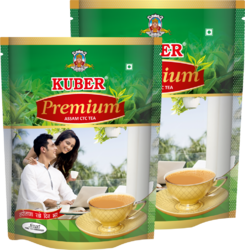 The offered tea is praised in hotels and home, processed using premium quality tea leaves and advanced technology in line with industry norms. Our quality examiners test this tea against different quality measures so as to ensure its quality. We are successfully meeting the varied requirements of our clients by providing the best quality range of Assam Black Tea. - 99 Rs. To 250 Rs. Per Kilogram. Premium Whole Leaf Assam Black Tea which has flavorful aroma and taste. Available Pack Size: 20gms, 50gms, 100gms, 250gms. A rare symphony of finest Indian spices like Ginger, Cardamom, Cloves, Cinnamon and Nutmeg, this aromatic blend is a must have for all. A fusion of strength and freshness, you will definitely feel like flowing with the great BRAHMAPUTRA. 1. It has anti- inflammatory and anti-oxidants properties. Santushti Gold Tea is a perfect blend of finest Assam CTC Tea leaves. The rich taste leaves behind freshness and relaxation. 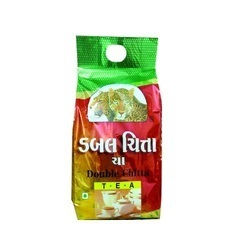 say goodmorning with santushti gold tea. Supper assam danedar chai is another form of supper assam dust. The main difference is the physical nature of the products. Supper assam dust is powdered tea while danedar chai is round cut leaves of natural tea.